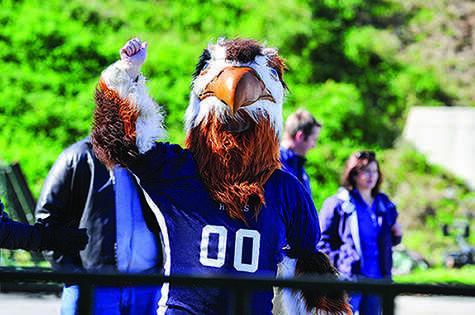 The Saint Anselm Hawk mascot. It appears that for the foreseeable future, Saint Anselm College Athletics will remain a member of the Northeast-10 Conference, and will continue to compete in the NCAA Division II. 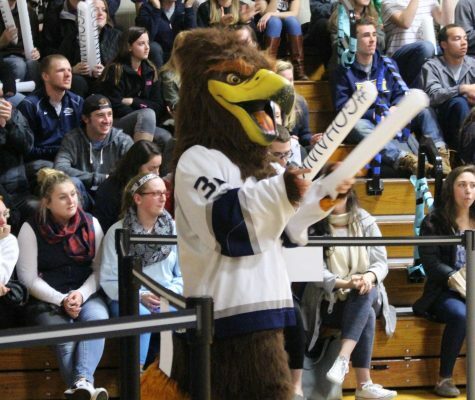 According to a report on Friday, April 8 by The New Hampshire Union Leader, Saint Anselm had applied, but was not accepted into the New England Women’s and Men’s Athletic Conference (NEWMAC), a Division III conference based in Boston, MA. 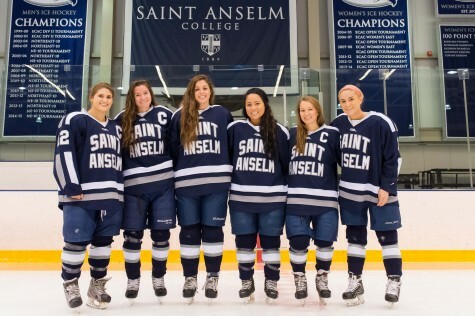 Had Saint Anselm been accepted into the NEWMAC, they would have been competing in the same athletic conference as Babson College, Emerson College, Springfield College and MIT among other institutions. 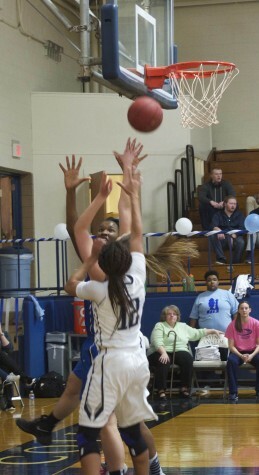 The Crier reached out to officials within the NEWMAC for comment, but did not receive a response. Those future options could include Saint Anselm remaining in Division II and the Northeast-10 Conference, or finding another Division III conference open to accepting new members. 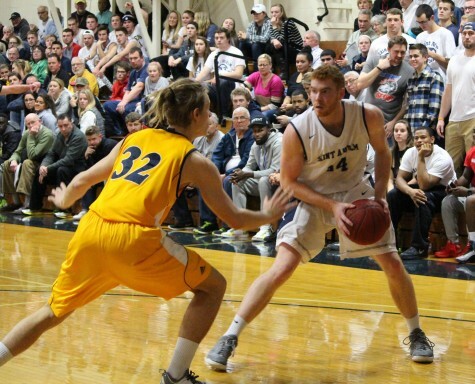 An NCAA Division III conference in the area that could be an option, perhaps remote, for St. A’s is the New England Small College Athletic Conference (NESCAC). The NESCAC is based in Hadley, MA and is comprised of eleven schools from Maine, Vermont, Massachusetts and Connecticut. Amherst College, Bates College, Bowdoin College, Tufts University and others currently make up the conference. 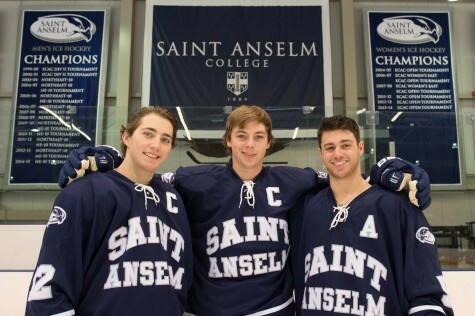 The NESCAC also offers many of the sports Saint Anselm currently plays within the NE-10. Due to a level of uncertainty in regards to the future of the college’s athletic department, there could also be an effect on recruiting new athletes. “This year has presented some challenges for our coaches in terms of recruiting, but we remain focused on making a decision that is in the best interest of our Athletics program in the long term as we move forward and continue the exploratory process,” Montgomery added. I’ve been a student, a graduate, and a loyal alumni since 1964 (52 years) and have been very disappointed in what’s going on in the athletic program over the past year. A lot has been said by the loyal alumni who have supported the school over these many years with the decision by St A’s management to attempt a move to D3. This is not good news. The NEWMAC was a terrific fit for us. It is unfortunate we didn’t sell those schools on why we are a good fit based on academic reputation, geographic location, facilities and athletic tradition. No one can explain what DII Athletics does for the school. If you can, please shoot me a note. The only DII competitive sport year in and year out is the Men’s Hoops teams. Coach Dickson and his athletes continue to compete on the National level. It is amazing what the basketball program does. But because the College won’t properly fund full time coaches and additional scholarships, DII competition will continue to be a black eye for the College. Look at the other sports. I feel bad for those student-athletes because they compete hard and want to represent the College in a positive manner. But they run into scholarship athletes who, in a bunch of cases, are at inferior Colleges or the College gives them admission but they don’t truly meet the requirements for admissions. We also can’t fool ourselves and think the NESCAC going to welcome us with open arms. Those colleges are some of the absolute finest in the world and are rich with academic excellence and tradition. We are also a Catholic College and I doubt that fits in with those Colleges. They certainly do not need us for any reason. 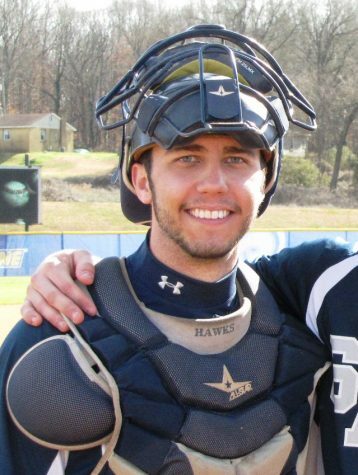 Its a very uncertain and pivotal time for the Hawks. I do not have the answer other than we are a better fit for DIII than DII unless the school wanted to truly make the investment into DII and or even DI (never happen). Remote, indeed! With a 76% acceptance rate and test-optional SAT median range of 1080-1220 (which ignores the 35% of applicants who didn’t submit presumably even lower SAT scores), St. Anselm’s profile isn’t a fit with the ‘dregs’ of the NESCAC like ConnColl and Trinity, much less its nationally elite members. 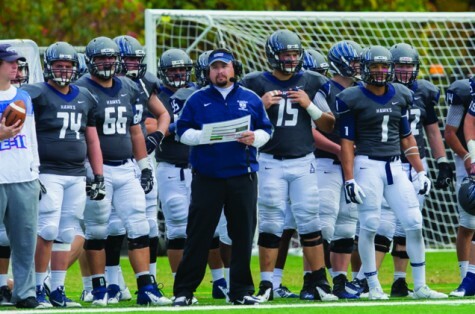 The NEWMAC was already a stretch academically; the NESCAC is a non-starter. 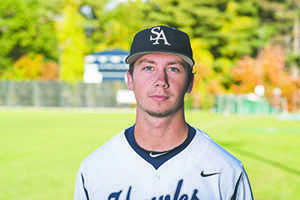 Anselm should look carefully at D1 in thr America East conference. UMass-Lowell has made that work. How about the Patriot League? 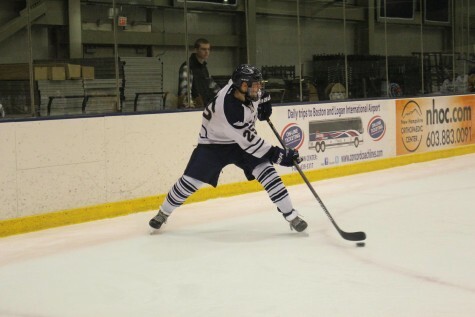 St. A’s would be a better fit than the entry of Boston University into the Patriot League a few years ago. The small size of St. A’s accompanied with the close proximity to Boston could draw a healthier group of D-1 athlete types that could compete well in this league. The Patriot league is known to have probably the most clean cut group of athletes of the D-1 schools with a host of high academic schools in the top 100 in the country. The presence of two Catholic Institutions, Holy Cross and Loyola would be very welcoming for St. A’s. The question would be whether St. A’s is high academic enough. If you look at their recruits, you will see athletes that have received a good combination of D-1 and D-11 offers with the D-1 offers limited to one or two only.